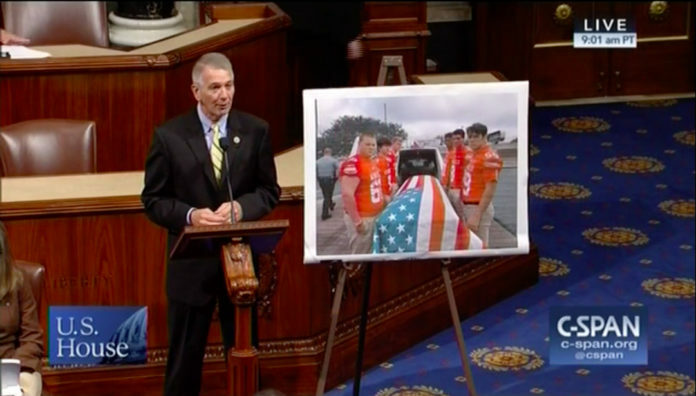 WASHINGTON – Congressman Ralph Abraham, M.D., on Monday delivered a speech on the House floor recognizing six Winnfield Senior High School football players who served as pallbearers for a WWII veteran. Thomas Edward Hunter, 93, died on Sept. 12. Because he had no close family, he had no pallbearers for his funeral. After learning of the situation, Winnfield players Matthew Harrell, Brett Jurek, Justin Lawson, T.J. Homan, Christian Evans and Lee Estay volunteered to serve as Hunter’s pallbearers. The speech can be viewed on YouTube here. I rise today to share with you an inspiring story about a community rallying to honor one of our nation’s heroes. On Sept. 12, Thomas Edward Hunter passed away at the age of 93. He was a World War II veteran who reportedly served at Normandy and fought with our troops to liberate Europe from the Nazis. Unfortunately, Mr. Hunter spent his final years mostly alone in a nursing home, and died without much close family. He outlived all his siblings, and never married or had children. As a result, he had no one to serve as his pallbearers. Word of Mr. Hunter’s passing reached the folks at Winnfield Senior High School, which is in a small community in rural North-Central Louisiana that I have the privilege to represent. After hearing about Mr. Hunter, six Winnfield football players – Matthew Harrell, Brett Jurek, Justin Lawson, T.J. Homan, Christian Evans and Lee Estay – stepped up to serve as pallbearers. Additionally, the folks at Southern Funeral Home arranged for military honors at Mr. Hunter’s funeral service, complete with a flag and a playing of Taps. I am so inspired by the actions of Matthew, Brett, Justin, TJ, Christian and Lee, as well as others in the community who gave Mr. Hunter the hero’s send-off he deserved. They didn’t know this man, but they knew that every veteran deserves to die with dignity and be honored for the sacrifices he made in defense of this nation. Mr. Speaker, I think the actions of these young men speak volumes about what’s truly important: Country, community, family, God. Our flag and the nation it stands for is special because of veterans like Thomas Hunter who answered the call to serve. Thousands have given their lives for that flag and this nation, and they deserve our respect for their sacrifices. These young men in Winnfield get that, and I think others in this country will learn from their example. Previous articleMSGT. (RET) ROBERT BRICE MIDDLETON JR.